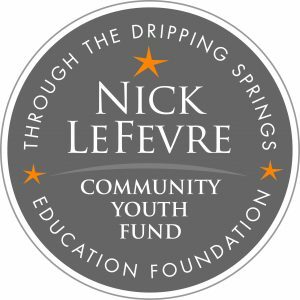 Administered by the DSEF, the Nick LeFevre Community Youth Fund is established in loving honor of Dripping Springs resident William N. LeFevre by his wife Marilyn. Applications are considered on a rolling basis throughout the year and may be accessed at www.dseducationfoundation.org If you have any questions or need further information, please feel free to contact DSEF. *The Dripping Springs Education Foundation respects your privacy and will take reasonable and necessary measures to protect the information and documents you provide to us. The information you submit in this application or on any supporting document provided to the Dripping Springs Education Foundation will be treated as confidential information.